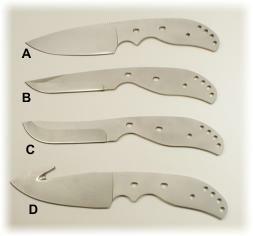 Great little blades, these are sized right for the most in usefulness. I wondered about the handle design when I first saw these, but if you hold one, you realize that some thought went into an ergonometric feel that fits the hand extremely well and gives a good solid , sure grip. I think these look best as a guardless design with scales only which makes them perfect for your first project. The Sasquatch with it's generously curved belly is a perfect skinning blade while the Sequoia is a great general purpose blade. Both are hollow ground. The Redwood is a great camp knife and reminds me of an outdoorman's chef's blade while the Cypress features a very useful gut hook. Both feature one of the nicest flat grinds I've seen in a while. Tang and thong holes are 3/16"
Whether you're going big game hunting or just want to impress your camp mates, these serious blades bring a high level of performance to your game. The Toro Blade is a whopping 15 1/2" long and a quarter inch thick , while the Ismhael displays some wicked and beautiful curves. And while you won't cut down the back 40 with the Saxon Hatchet, this useful hiking sized tool may become your best campsite friend. All designed to put in a good hard days work. 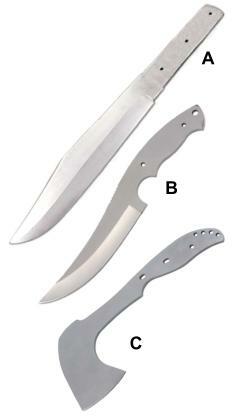 The Tanto Blade is a traditional design, a solid,hard working blade with a tip optimized for piercing. Toro (A) 440C stainless, a whopping 15 1/2" overall with a 10" blade and almost a quarter inch thick ( .230" to be exact). 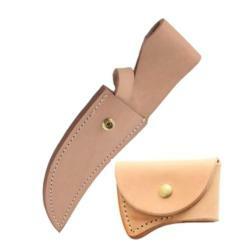 Pin holes are 3/16"
Ishmael Leather Sheath, unfinished strap style leather, you'll also need a snap setter to install the snap.